Like an ambitious toddler, the stabilisers are off and I’m already looking at bigger things. It’s been a crazy couple of days, we have been working feverishly hard to get everything lined up to Launch this website and there is still so much we want to do!! 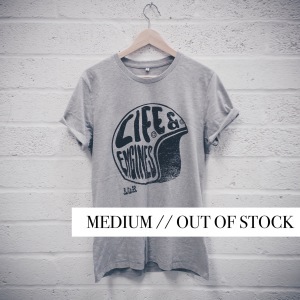 We have more clothing coming, after launching yesterday – we sold out completely in size medium Life & Engines Helmet t-shirt – so more of those are definitely on the way! Every t-shirt produced uses screen printing to achieve the highest quality – everything we will sell is made with quality, care and deliberation AND on top of all of that we’re trying to be as eco-conscious as possible. We will keep you all updated, thank you to everyone for the love so far – We have so much more coming and we can’t wait to share it with you!